Following the end of the First World War, German production of aircraft engines and related parts seen as means to start another war ceased by the terms of the Armistice, formalized by the infamous Versailles Treaty. The company consequently shifted to motorcycle production by 1923 once the restrictions of the treaty started to be lifted, followed by their first automobiles in 1928. The early success of the outstanding BMW IIIa inline-six aviation engine, from 1917-18 in World War I, with the Luftstreitkräfte in a limited number of Fokker D.VII fighters, as well as a number of prototype “inline-six” fighters from various manufacturers, might have actually influenced the BMW logo’s design. The circular blue and white BMW logo or roundel is often alleged to portray the movement of an airplane propeller, an interpretation that BMW adopted for convenience in 1929, which was actually twelve years after the roundel was created. In fact, the emblem evolved from the circular Rapp Motorenwerke company logo, from which the BMW company grew; the blue and white colors of the flag of Bavaria had at least as much influence over the design. With the close of the Second World War spelling disaster for German industry, initial automotive offerings from the ruins of remaining production facilities were a good representation of the needs of the German people. The company’s initial non-microcar model, the 502 released in 1952, did not sell well, but allowed their design studios to slowly work towards more workable models. From this, the first postwar sporting car, the BMW 503 represented a similarly-modern styling exercise put into production. Based on the 502’s box- and tubular-section chassis, it also shared its 3.2-liter V-8 engine. The four-speed manual gearbox was mounted remotely on early models, as on the 502, but was placed in unit with the engine from late 1957. 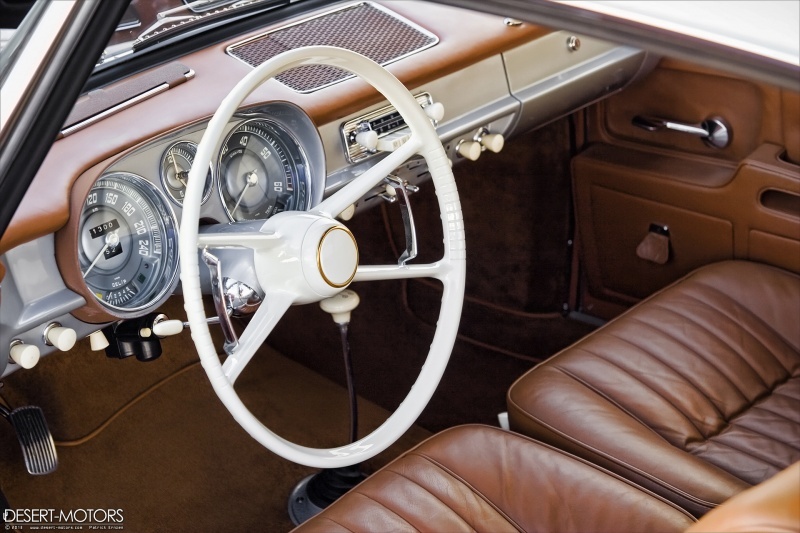 The original steering column shifter gave way to a floor-mounted mechanism on later examples. Offered in sleek coupe or cabriolet (convertible) body styles designed by Count Albrecht Goertz, both variants offered 2+2 accommodations. 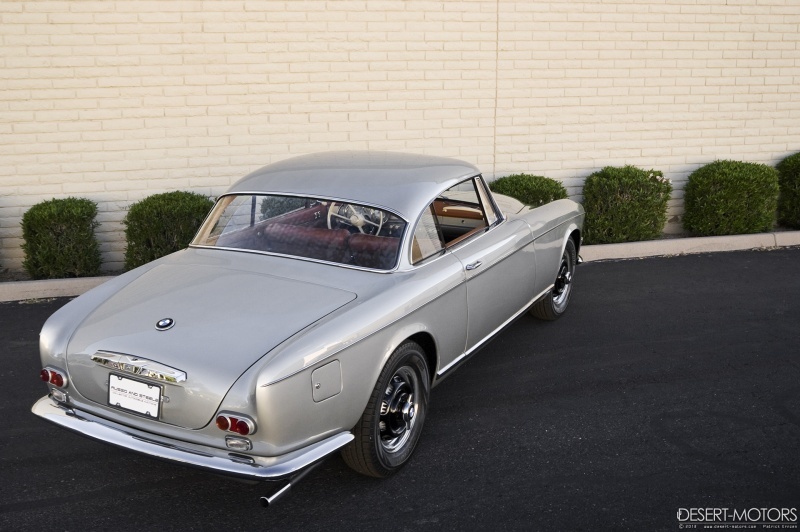 Like its sedan counterpart, the 1956-1959 BMW 503 nevertheless was an expensive indulgence but a great image builder for BMW, whose motorcycle and compact car production did not project as prestigious a stance to counteract the many financial problems suffered in preceding years. 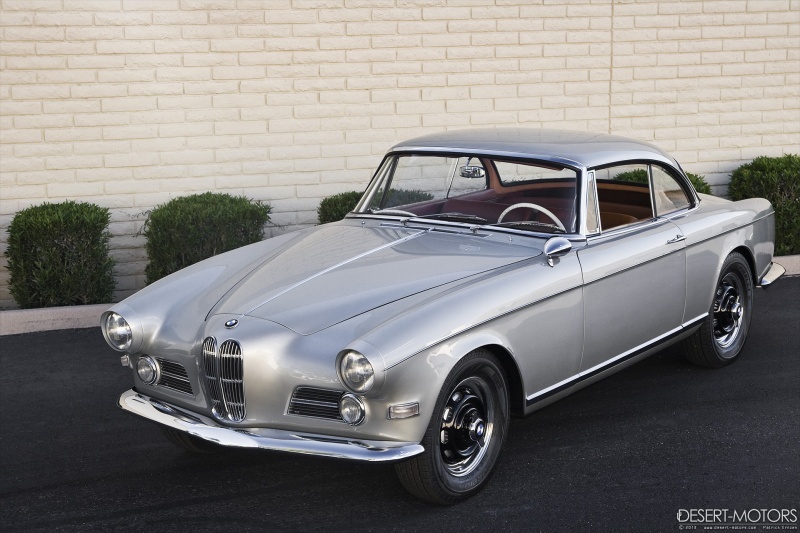 The last-year BMW 503 offered here was a European-market car from new. Finished in Brilliant Silver and fitted with rare Rudge wheels, a period Blaupunkt radio and a floor-shift four-speed transmission, it appears to feature most of its original finish throughout with only minor touch-ups. As such, the body seems not to have ever been rusted or hit and doors and panels fit as they were assembled fifty years ago. Chrome and brightwork is also original and excellent throughout. Inside, the incredible original interior shows well with nicely-patinaed leather and what appears to be correct older replacement carpet that extends to the luggage compartment. Under the hood, the detailed engine compartment reflects the same careful preservation offered the rest of the car. Relatively unrestorable given the dearth of these cars produced when new, an excellent original such as this example is the hands-down choice for the discerning collector as fewer and fewer nicely-optioned examples of this caliber will continue to surface in the coming years. Unlike most automotive websites, which are focused primarily on one type of automobile, make or model across the nation or even world, Desert-Motors is focused on the regional automotive community; from Italian supercars to custom motorcycles to Japanese compacts. All images appearing on the Desert-Motors.com web site are the exclusive property of Patrick Ernzen (except where noted) and are protected under the United States and International Copyright laws. All images © 2005-2017 Patrick Ernzen, Desert-Motors.com. All rights reserved.